Today I'm gonna share something different but beneficial for everyone out there especially bloggers or business owners who wants to reach out their website or contents to more audiences through Facebook. In this decade, the fastest way to advertise your brand or content is through the platform that you'll use everyday - Facebook. Duh, everyone in Malaysia is using Facebook everyday! However, given that Mark Zuckerberg has claimed that Facebook has changed their algorithm due to the feedback given by the community, this means really bad news for users who utilize Facebook as their business platform as each business profile in Facebook will be affected with very low organic reach. But fret not, there is a solution to this! 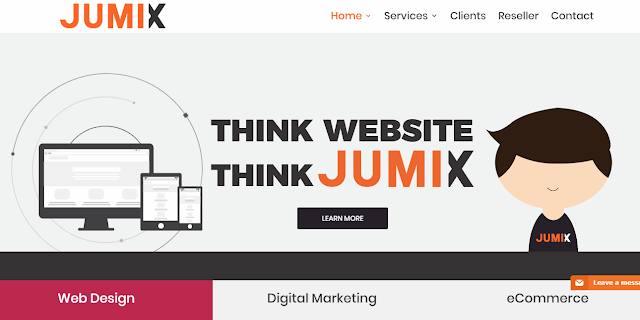 Introducing you Jumix, your web design and internet marketing expertise. Jumix is a web design and internet marketing specialist company founded on the principal of providing the best solution to businesses of all sizes. They focus on delivering maximum satisfaction and strive to provide the optimum solution for all our customers according to their needs. 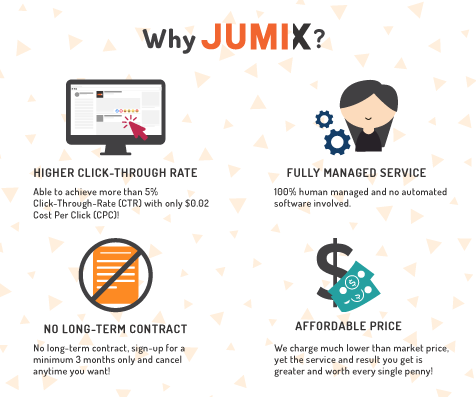 So why do I say Jumix is your current Facebook Advertising solution? Jumix can push your content to more people by riding on the strength of Facebook ads platform.With an affordable price, your content will reach out to more real interested audience that will garner more clicks or followers as well. This way your brand or blog will increase in publicity or conversions. Now even better when you can save more with their Facebook Ads Management #HUATGOUGOU deal and reap a huge profit! Go to this link https://jumixdesign.com/cny2018/ to enjoy 50% off worth up to RM900 when you sign up from now till 28th of February 2018. Let’s all HUAT together! For more information, kindly visit Jumix Website: https://jumixdesign.com/.